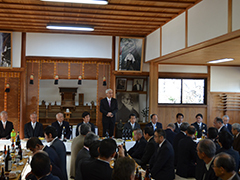 The ceremony of Ibaraki Dojo Kagami Biraki was held on 20th January starting at noon. About 100 people gathered in the event including Moriteru Ueshiba Doshu and Mitsuteru Ueshiba Hombu Dojo-cho, members of Ibaraki Dojo, Ibaraki Aikido Federation’s 14 Dojo and also the members of Homnbu Dojo. Before the ceremony started, this year’s first Aiki Shrine monthly festival had been held. The participants visiting the Shrine made their feeling anew by the Norito-sojo (the recital of Shinto prayers) by Doshu. “This year is the turning point being 50 years since the Founder passed away, also 20 years Kisshomaru, the second Doshu, passed away. During this period of time, thanks for pioneers, Aikido has spread into about 140 countries and regions all over the world and many people practice hard every day. Hereafter it is our duty to hand over this good situation to next generation." Then Hiroshi Isoyama, the counselor of Ibaraki Dojo,Nobuki Yamaguchi, mayer of Kasama city, Yoji Tsunei, the member of the Ibaraki Prefectural Assembly gave a message of congratulations and greetings, then, Kagami Wari (ceremonial opening of SAKE barrel) was held. 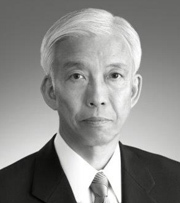 After greetings by Kenji Hirasawa, leader of All-Japan High school federation, ceremony was closed cheerfully. Last year the whole world was fiercely shaken by various natural disasters such as earthquakes, large typhoon, extraordinary hot weather, etc. and also a series of enormous social incidents gave tremendous impact to our world. Under such circumstances Aikikai Foundation was able to close the year safely, and I am grateful that we can have the New Year like this. Looking back the past I recall, as if it were the event of yesterday, Kagamibiraki ceremony with Hono Embu (presentation of techniques dedicated to the Deity) and solemn conferment of diplomas on the exact day when the Showa Era ended and Heisei Era started. His majesty the Emperor will abdicate on 30th April this year and becomes the retired Emperor. On this day Heisei will close and new Era name will start. On the occasion of such a milestone of our history everything may appear renewed. Still, the steady walk of Aikikai towards the new future will continue as ever with no change to our annual events and dispatch of our instructors to overseas. It is important for us to complete our annual schedule one by one as planned. This year the National Health and Welfare Festival called “Nenrin-Pic (growth ring sport fair)” will be held in Wakayama Prefecture, which is a festival of sports and culture featuring the people over 60 years old. In Tanabe City, the birth place of the Founder Morihei Ueshiba, the interchange events of Aikido, Archery and football will be held. Different prefectures throughout Japan have organized Nenrin-pic every year since it was started in 1988, and this year it becomes 31st gathering. Nenrin-pic is not intended as a tournament to decide the winner but it will be organized as an opportunity for interchange of different sports and culture, of which concept matches the spirit of Akido “harmony” and I am happy to welcome it. Thus, to put spot-light on the senior people over 60, who have much experience and knowledge of life, can be an excellent and future-oriented endeavor to emphasize the significance and importance of passing healthy daily life in the matured society. It calls my attention that there are a number of people who have continued Aikido practice for decades and have reached at senior age, or people who started Aikido after retirement from his/her professional career at senior age and continue their Aikdio life. This is the same with other Budo, sports and culture activities. Nenrin-pic will be a wonderful interchange opportunity to encourage activities of such senior Budoka and sportsman. In the year when the Era Name changed to Heisei, Kisshomaru 2nd Doshu marked his 20 years as Doshu after he had succeeded the position from the Founder. This year, when Heisei is going to be changed to new Era Name, I happen to mark my 20 years also as Doshu since I succeeded the potion from Kisshomaru Doshu. Reaching at this milestone of 20 years, I feel obligated to express my sincere gratitude to everybody especially to my predecessors as to my past and present position. I am filled up with the gratefulness for historical flow that my grandfather Morihei Ueshiba founded Aikido with the support of my great-grandfather Yoroku Ueshiba, and my father Kisshomaru Ueshiba 2nd Doshu created the foundation for Aikido propagation into society enabling my present action possible to disseminate this art even broadly to the world, and my son Mitsuteru is continuing hard training every day to inherit my position someday. No matter how far the AI may grow itself in our society, it is our duty and most important action as human being that we respect and extend our thanks to our ancestors, and inherit good tradition from them. The blood of my ancestors is flowing in my heart. Now Aikido has spread to 140 countries and/or regions. I believe that our attitude to respect the Founder and esteem the treasure he left to us has enabled this remarkable accomplishment. Toward the new era, I would like to continue my steady walk on this way actively, passionately, thankfully and humbly always cherishing Aikido spirit. This year is the year of wild boar in Japanese calendar, but I will not rush like a boar. I would like to keep my constant pace to move forward with relaxed mind.